Banners are effective indoor or outdoor advertising tool, either alone, or used in combination with inflatables and/or balloons. Fixed, permanent signage is expensive, hard to change, and subject to stringent sign code requirements. 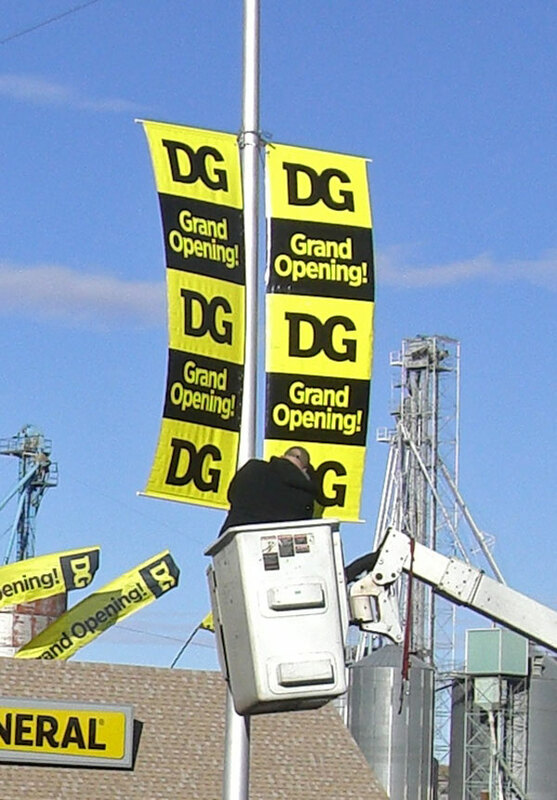 Banners are inexpensive and can be changed to fit changing seasons and changing promotions. Change keeps your business memorable to the public Businesses with a static appearance fade into the landscape and are forgotten. Banner advertising and pole displays provide an inexpensive method of creating change and making your business memorable. Need to communicate a complex idea with a banner? Summarize the idea, but offer a QR code on the banner as a link to a more detailed explanation on a web page. Banners draw attention - And Spot Promotions' experienced production and installation team ensures a good impression. We create banners that look great, are easy to read, and are hung properly. Our attention to detail displays pride in your business and demonstrates your professionalism. Spot Promotions produces and installs banners. We offer competitive prices on custom and generic banners, and banner installation. Spot can install a banner on your building, on a fence, or on stakes in the ground. With 15 years of experience, our banner creation, banner production and banner installation is done right! Get Creative and Seasonal with Banners!